You are here: Home › Garden design › Are your borders Full or Fighting? Are your borders Full or Fighting? • Comments Off on Are your borders Full or Fighting? As you would expect, I see a lot of gardens in my work as a roving gardening advisor and this summer I have seen a few borders that have reached that wonderful stage of being full of colour and shape throughout the summer: no bare soil and almost a solid 3D wave of flowers and foliage. But plants are not static pieces of sculpture or furniture and it is all too easy for a magnificently exuberant border to cross the line from Full to Fighting. If you are currently admiring your own jam packed borders, then now is the time to start planning some necessary work this autumn to make sure that next year that your riot of colour does not become a fight to the death as the more vigorous plants overwhelm prized, but delicate, specimens. 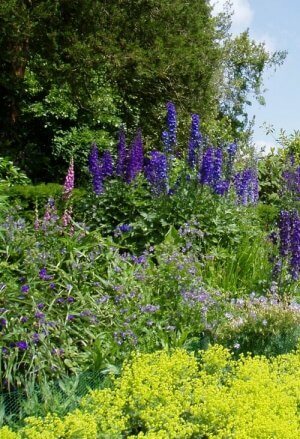 In a mixed border you also need to manage the size of the shrubs and the most important factor here is probably now out of your control: namely planting them with enough space to grow to maturity. Unfortunately the temptation to plant shrubs much too close together appears to be overwhelming for many people! If you are faced with shrubs that are truly entangled then the choice is unsatisfactory maintenance of both or sacrificing one. If shrubs are well spaced then you simply need to prune them annually. The key is knowing when they flower so that you can prune without losing the next season’s buds. And of course, you will remember to take photographs to remind you what needs doing and plan your autumn gardening won’t you? ← Do you need a prairie sized border for Prairie Planting?